View out the front windshield of a 2012 Ford Focus driving around Syracuse, New York. Nikon D700/11-16mm, 3s, f/16, ISO 1600, EV 0, 16mm focal length. My wife drove me all over Syracuse, New York as I rode in the backseat trying to get a good long exposure photo out of the front windshield. Something I have had on my list of things to try for awhile now. I wonder if any of my readers from Central New York can guess where this was taken. I used a monopod to allow me get a good grip on my camera during the 1 to 3 second exposures I used. The photo above is the only one from the night drive which came out fairly sharp in the car at speed. 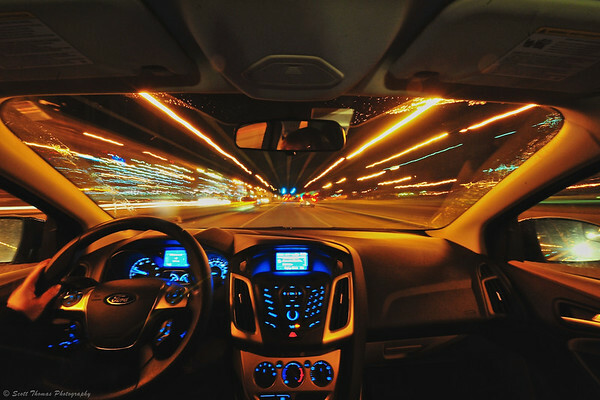 This entry was posted in Weekly View and tagged blur, dash, driving, focus, ford, light, long exposure, motion, new york, night, nikon D700, streaks, syracuse. Bookmark the permalink. It is one of those cliché photos but I wanted to give it a try. Never know when it will come in handy on a trip or stock photo request. She’s a good sport and continues to humor me through some nutty photography adventures. Could you or someone link me to FS photo? I tried to find it but could not. Thanks! That’s a good outcome of the drive. You caught the speed. -Do you have the yellow sodium lights all over? I do not always like the color, but here it matches the dashboard fine. Yup, we got sodium lighting all over the place. I may try and play with the white balance to try and pull out more colors. The dash is a dark gray which picked up and balanced the lighting. Thanks, Carsten! I’m afraid the white balance will have a hard job. The light is practically monochromatic. But you could modify the color in PS if you want to change the look. Very true…like the idea of changing the sodium light color. I love this photo – so full of speed and colors. And driving you around like here – your wife must be one of the (few?) women around you, that both understand you and your car! What a wonderful, futuristic photo. Bet the folks at Ford would like it !